James, Ife and Tulani on swings at the playground down the street from our house. We are up to X on the Family History Through the Alphabet Challenge. I continue my trek through streets in my life. I admit that I had to cheat for this letter. I have never lived on a street or in a place or even visited one that started with an X. I did live for three years in eXcelsior Springs, Missouri though. Today I will remember my time there. By happy coincidence, the theme for Sepia Saturday #149 is healing waters, which is what eXcelsior Springs was once famous for. 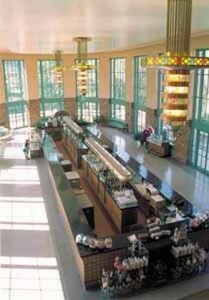 It is still home to the longest water bar in the world. 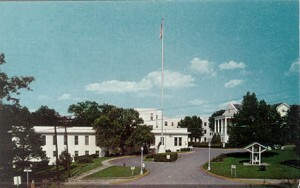 The Minact Job Corps is located in the old Veteran’s Hospital. 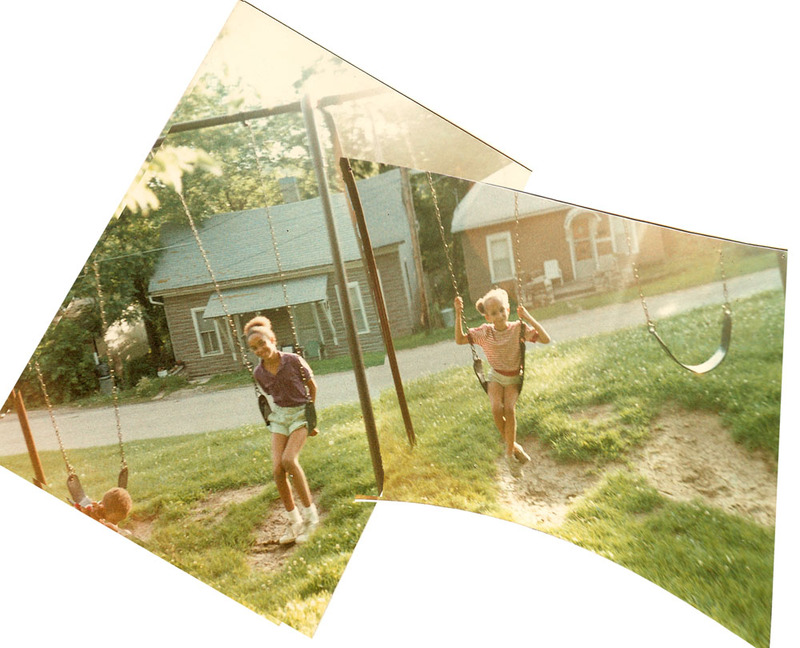 In the fall of 1983 we moved to Excelsior Springs, Missouri from St. John Road, rural Mississippi. My husband Jim had heard from a friend about an opening at a new Job Corps Center opening in eXcelsior Springs. He had several siblings in nearby Kansas City and even more relatives in St. Louis, 4 hours away. 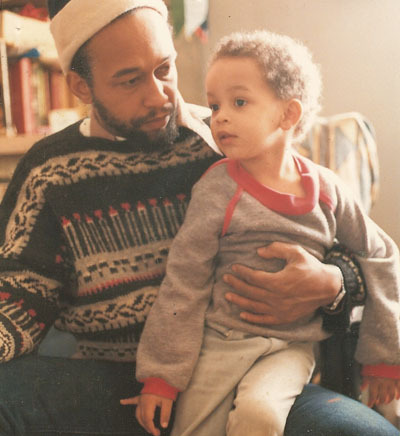 He was hired as weekend residential supervisor and began work during the summer of 1983. Several more months passed before he found a house for us to move into. It was on the side of one of the many hills that made up the town and in the towns very small black community. Down the street was the empty former black school from back when schools were segregated in Missouri. There was no segregation in 1983. 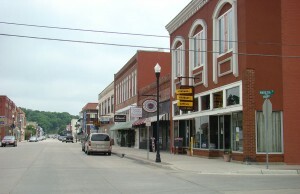 The population of eXcelsior Springs was 10,000. Our house was within walking distance of the children’s schools, my husband’s job and downtown. Unfortunately downtown was moving store by store out to the edge of town to a strip mall across from the new Walmart store, which was not within walking distance. Still, there was a department store, a small grocery store, a drugstore and a florist that we could walk to. Our only transportation, aside from our feet, was a pickup truck with a camper on it and a stick shift that we drove from Mississippi. Later my brother-in-law left us his Rabbit while he was overseas in the service. There was also a van that fell to pieces almost as soon as we bought it, very cheaply I must say. Tulani and Ayanna sliding in front of the house. Me, James, my husband Jim. next row: Ayanna, Tulani, Ife. Very back: Jilo. Living on the side of a hill gave us a great view of the trees and houses during the changing seasons. In the winter, though, the roads were snowy and icy. I had learned to drive in the south and was not used to winter driving. 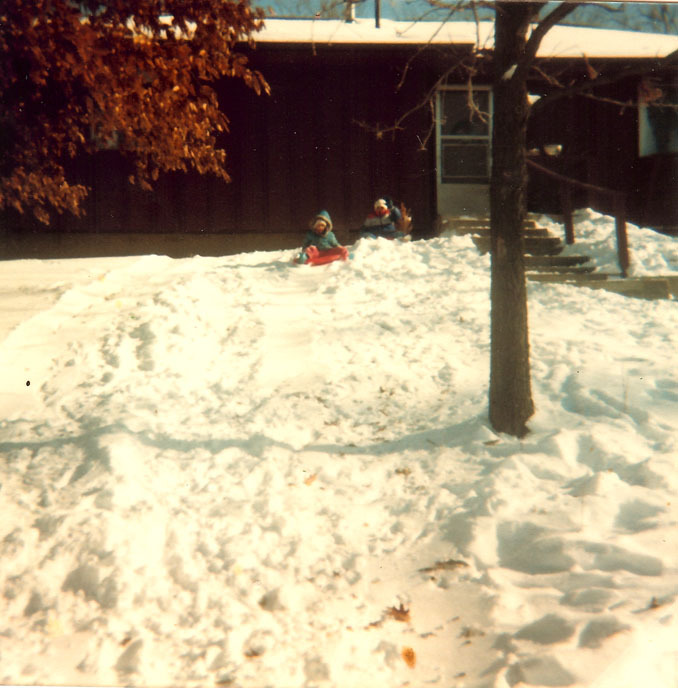 When the first heavy snow fell, I went out in the yard with the kids and played in it. We couldn’t understand why none of the neighbors were out there. After several more years, snow didn’t seem so glorious. Still nice though. Sewing a soft sculpture doll. Cover from a book of Cabbage Patch clothes patterns. I had learned to make soft sculptured dolls that were called “Adoption Dolls” in Mississippi. When these type of dolls began to be mass produced they became the “Cabbage Patch Dolls.” The original dolls were 36 inches tall but I made a smaller pattern that turned out to be the same size as the “Cabbage Patch Dolls”. I also designed a small, 6 inch doll, that I soft sculptured using the same technique. This was very lucky because Christmas of 1983 was the year that there were not enough of the manufactured dolls to go around. 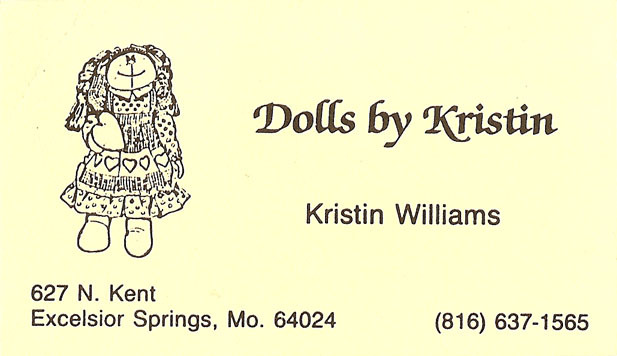 I sold dolls through several gift stores both in eXcelsior Springs and in Kansas City. I sold to individuals too. I was sewing dolls day and night. There were boxes of doll heads and arms and legs in the living room. The children helped stuff parts. My husband helped stuff. A sister-in-law came and helped stuff. I put an ad in the local paper and more people came to me through that. There were so many orders I was up all night Christmas eve finishing up my own children’s dolls. The money came in very handy to winterize our wardrobes – “Moon” boots, winter coats, scarves, cloves – we needed all of that. The three oldest had jobs. Jilo baby sat the neighbor’s kids after school until their mother got home from work. 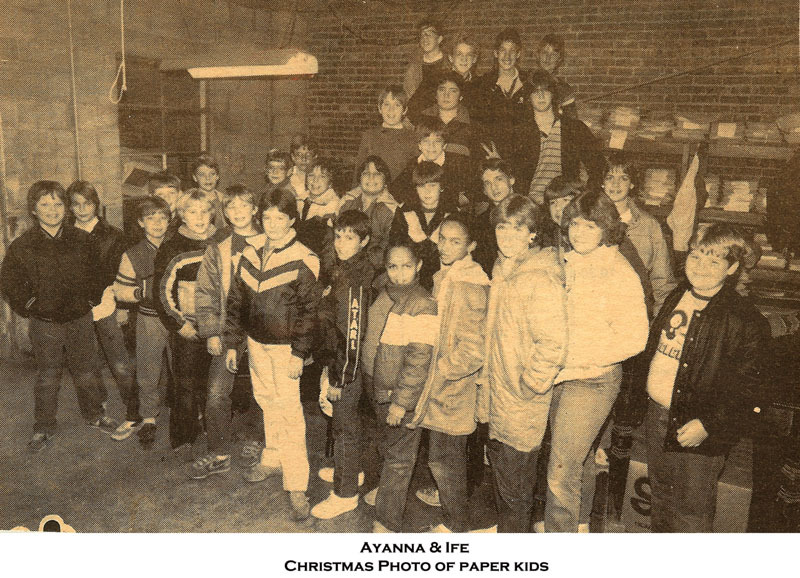 Ife and Ayanna had paper routes. I still remember the icy time when I helped Ife deliver her papers and we were practically crawling down the icy slope to the house when a boy came up and offered to take it and just hopped down there like a young mountain goat. I remember the food co-op I belonged to and selling dolls at the Fishing River Festival. I remember the wonderful Community Theater. Jilo and Ife were both in several of their productions. I remember walking to the evening elementary school Christmas Program with my kids and the neighbor kids. Jim was working 40 hours weekends so he missed it. The audience sang Christmas carols at the end and we walked home in the dark. I remember walking for exercise on the path down by the Fishing River, sometimes with my friend Roberta. I remember our first Christmas when we waited until Christmas Eve to buy our tree and there were no trees to be had. I remember usually having several extra kids at the house and discovering “Prairie Home Companion” and Mercedes Sosa on NPR. I remember James imaginary friends “Nice” Tommy and “Mean” Tommy, “Nice” Helmut and “Mean” Helmut and Ayanna’s town of Zamziwillie. I remember Ayanna losing one of her boots on the way home from school. The kids were sicker in this town than anywhere else we lived. Tulani had pneumonia, Ayanna had vomiting that wouldn’t stop, there were warts and ear aches. Doctors and hospitals. One thing I don’t remember is the taste of the various waters from the healing springs because I never drank any. What a wasted opportunity. To read some eXcelsior Springs history and about the healing waters that flowed there, click. 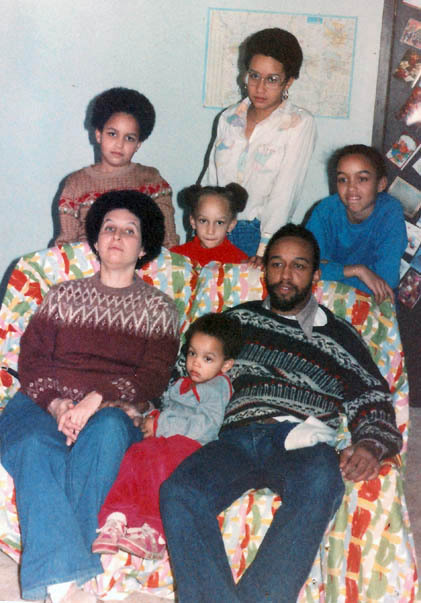 i do love seeing those family pics. you have so many talents! Adaptability is a word that springs to mind … you seem to have made the most of wherever you went. And your dolls look beautiful. Adaptability is a good word for me. I love your dolls, especially the small ones. 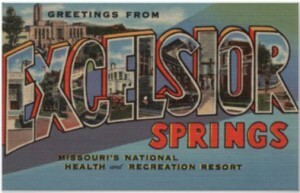 I have a comic postcard from Excelsior Springs. It says “sulpho-saline water gets results” and shows an outhouse. The small ones were my favorite too. What a happy coincidence that your alphabet challenge and Sepia challenge came together. 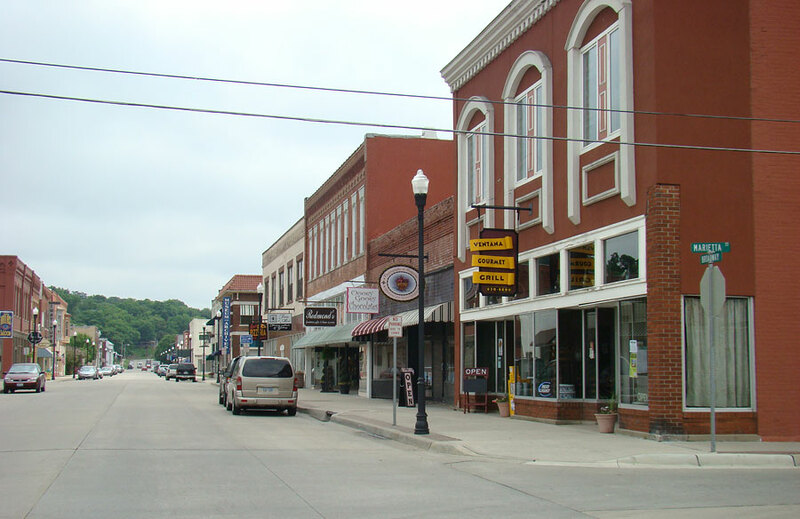 At first I thought I had visited Excelsior years ago, but then I remembered the town was in Arkansas, not Missouri – I actually visited Eureka Springs, not Excelsior. But I did enjoy visiting Excelsior through this informative post. I’m glad the prompt turned out to be about healing waters because I couldn’t figure out what it was at first. I’m still wondering about the old woman. This was a wonderful, wonderful post. I enjoyed all of it, and it gave me some ideas on how to go about writing down my memories. Those dolls are beautiful! 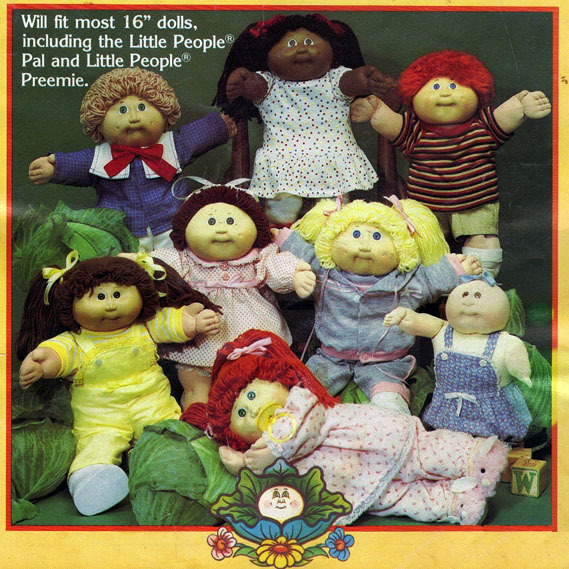 My girls were born in 81 and 82, and I remember Cabbage Patch dolls well. My Grandma made them each one; which we still have in storage. I’m so impressed with your dollmaking. 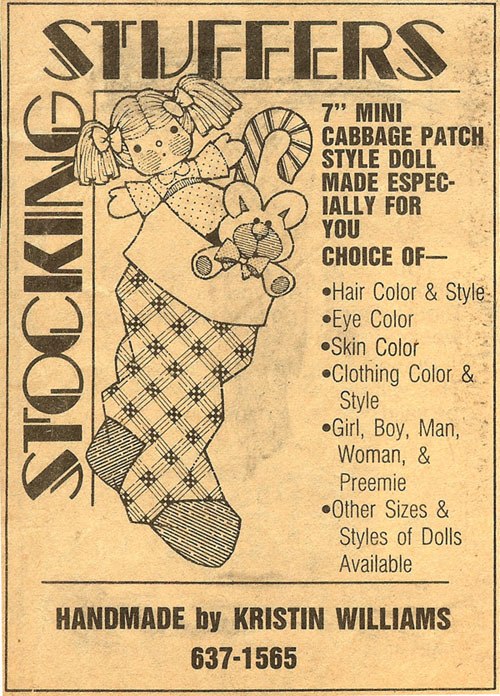 I remember searching and searching for one of the Cabbage Patch Dolls for my daughter in the 80s. She just had to have one. None were to be found in California and I had to have my aunt send one from Illinois so that Christmas wasn’t a complete bummer. I wish I would have known you at the time, I would have just put in my order to you. I noticed in the black and white photo of the newspaper carriers – one of the boys is giving the horn sign over the head of another boy – another photobomb. Wish you had known about me too. I had never heard of photobombs before my last sepia saturday post! A lovely post, Kirstin. It’s amazing how many of SS themes tie into our own experiences. You obviously enjoyed your busy family life in Excelsior Springs. And even I had heard of Cabbage Patch dolls. Contrary to Bob I had never heard of the Cabbage Patch dolls but I did enjoy reading your post. Thank you! After several years of sewing them, I wished I’d never heard of them either. The dolls are wonderful! I can see why they were to popular. The worst thing was when I would have a head almost stuffed and it would “explode” because the gathering stitches gave out and I was trying to fill it too full. I was the only one I let stuff the heads because of this. A trifecta post! People, places and double themes. Excelsior is a wonderful word and makes a great exclamation. It is also an old word for the wood shavings used as upholstery stuffing. I occasionally have found it in antique furniture that I’ve recovered. I bet it would work in Cabbage Patch dolls too. I think the excelsior would have made the dolls pretty heavy. Especially if they got wet. Dolls must have been stuffed with them at some point. I think the heads were sometimes made of compressed sawdust. I should look into that. A really enjoyable post. You told the story of your time here very well and how fortunate that it tied in with your alphabet and SS prompts! I too spent many hours making soft toys and dolls (I still do occasionally) over the years, and I know that feeling of last minute stitching. I haven’t made any dolls in years. One year I made regular rag dolls for my four oldest grandchildren. I haven’t made any since. I just make quilts now. 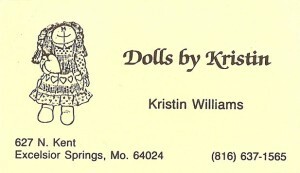 What wonderful memories you have of your time Excelsior Springs, you must have flying fingers to sew all those dolls. Oh I thought for sure these were cabbage patch dolls, they are wonderful. 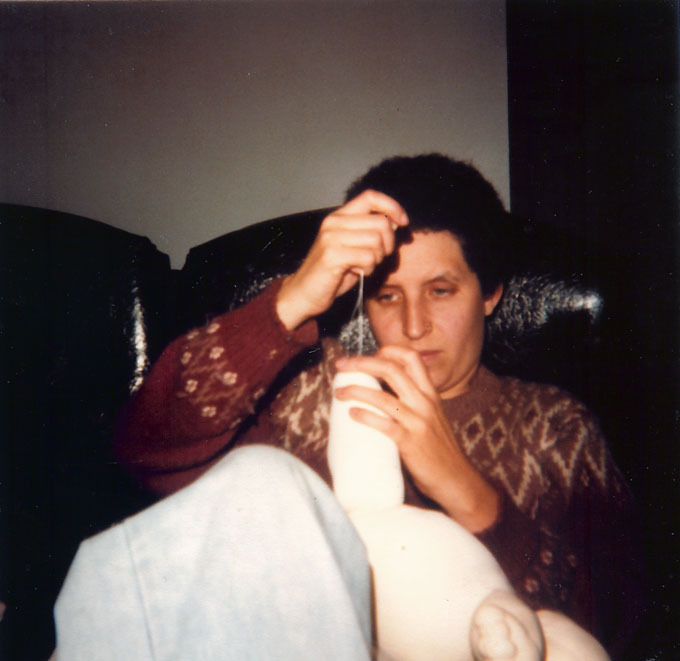 Once when we lived in CA women in our church group began to make dolls for children in the shelters, but they were not nearly as professional looking as yours, ours were only made from socks. A very interesting read as always on your blog. My mother’s grandmother and her mother and her mother were seamstresses and I did feel that period of sewing under pressure put me in touch with what they must have experienced on a bigger scale when they were sewing for a living, year after year with no break in sight. I always enjoy your posts, Kristin. You are multi-talented! Beautiful dolls, but I bet it got old after a while. 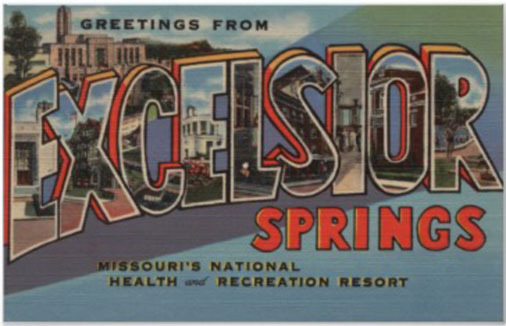 I have one old postcard of Excelsior Springs from about 1930 I think. I almost used it for today, but didn’t have a thing to say about it. Especially after I figured out that the amount I charged was paying for the materials but I was making very, very little for my labor. I charged $25 for the cabbage patch size and $10 for the little ones. Wow, Kristin, I love your dolls! What a singular talent you have! Your husband looks really handsome in those photos, by they way. What is a “water bar”? P.S. Your header almost looks like a photobomb! My daughters were trying to look like the dolls. Wonderful post. I enjoyed reading your memories of 1983 and seeing the photos of your family. You are so talented – the dolls are adorable. While I know it was a busy time for you that Christmas, I’m sure it’s one you’ll never forget! Not only do you come from a large and wonderful loving family, but you are a woman of many talents. What fun! Terrific post. I enjoyed every bit of it. You write so well and the dolls are wonderful. I’ll be hanging out on your site reading more! Glad you enjoyed the post and the dolls. 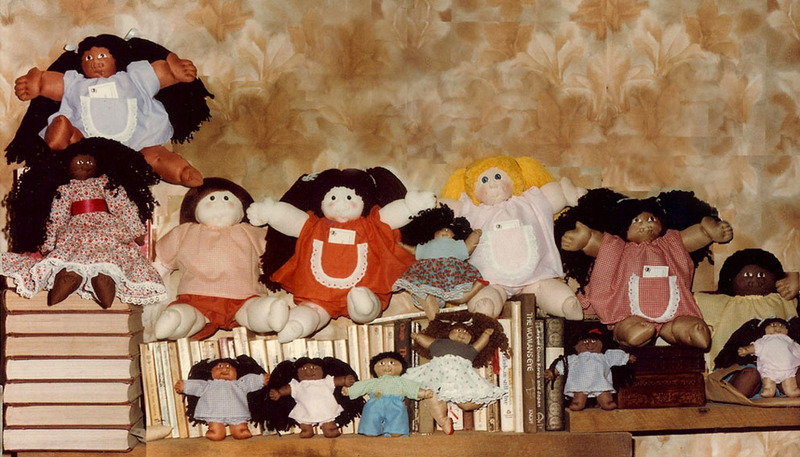 I do remember those dolls, but I think I was the only girl in school who did NOT want one, haha. I thought they were creepy. 🙂 It is always good to remember the good times. 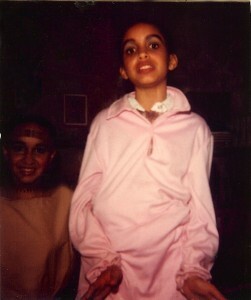 to be competing against those cabbage patch dolls, you had guts. I remember those only too well, they were EVERYWHERE!!! I thought I left a comment earlier but it doesn’t seem to be here.